All marriages at some point or another will have conflict. It's not an "if" there is a conflict; it's "when." These 5 steps to resolve conflict will help your marriage get back on the right track and restore oneness. 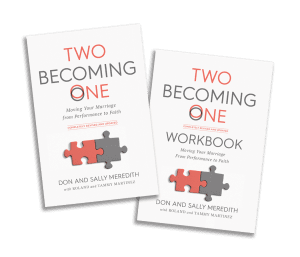 A recent post on 3 Requirements for Effective Communication discussed the ultimate test of a couple's ability to communicate comes when they attempt to resolve conflict. While not every disagreement or difference of opinion should be considered conflict, there are bound to be some issues that will need resolution. Not every instance of irritation or annoyance should be classified as conflict. When we define conflict in marriage, it usually occurs over a genuine disagreement. You see things one way while your spouse sees them another. It is during these times that we need to stop and listen and try to understand the other person's viewpoint. The purpose of resolving conflict is to restore the oneness of marriage. Without resolution, seeds of bitterness, anger, and resentment sprout and choke a healthy relationship. 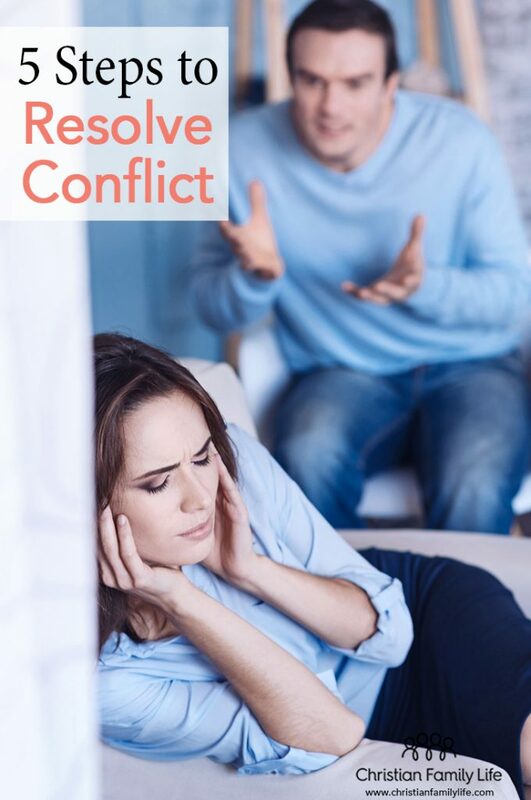 These 6 steps to resolve conflict will help begin the process of restoration. You will find that these steps focus on you and not your spouse. You cannot change your spouse's thoughts or behavior, and you are not responsible for their actions or feelings. You are only responsible for yourself, so focus there and let the Holy Spirit deal with your spouse. If this is an issue that as come up previously or if it is a new issue with strong emotional reactions, you will need to deal with these negative feelings before moving forward. Even if your spouse is not responsive, you may need to deal with them on your own until he/she responds appropriately. You are responsible for your own emotions not those of your spouse. At this time, you need peace in your heart and ultimately only God can give that peace. This peace comes by renewing your time with God's perspective from His Word. Remind yourself of God's promises to you and of His sovereignty over any situation. As peace and hope in God are restored in your spirit, the attitudes you project will begin to change. You will be one step closer to possessing the faith necessary to approach your spouse with a positive and hopeful attitude, even if your spouse does not have the same attitude. After dealing with your negative feelings by regaining the right perspective of God and who He is, the next step is to deal with your own negative behavior. Scripturally, this is getting the "log" out of your own eye so that your spouse can see the "speck" in his/her eye. Your spouse should be doing this as well, but again, remember that you are not responsible for the actions of your spouse. Sit down and think about the history of this conflict. List every improper action or attitude that you have engaged in and then ask God to forgive you. Seek his perspective on this so that you may avoid them same thing in the future. It may be difficult for your to see your own attitudes as wrong, but we encourage you to examine yourself thoroughly and take responsibility for you actions, however small or insignificant they may seem. If you can own a grain of sand in the conflict, it will help bring resolution. It may be that you do not have any improper action or attitude in this particular situation. If that is truly the case, it is wise to just pray for your spouse and not seek to point out his/her faults. After identifying any negative behaviors, being to evaluate wrong spiritual thinking that may have influenced these behaviors. Ask the Holy Spirit to help you in the process. This is a very important corrective step. Now it's time to make a commitment and develop a strategy to change and deal with the conflict. Everything mentioned before this point sought to ensure that YOU are best prepared to resolve conflict. Now let's focus on the conflict itself and figure out how to resolve it. Confessing our sins to God first and then to our spouse is an important part of conflict resolution. At this point, be sure to take full responsiblity for the appropriate behavior and feelings. But also don't take the blame for anything that is not yours either. It's important to keep those boundaries. Try not to say things like, "I'm sorry but..." Statements like this tend to absolve you of responsibility and place the blame back on your spouse. Commit to your spouse that you are going to do your best to avoid acting this way in the future and that you are going to trust God to help you change. Remember, changing involves two issues: God is the initiator of change through the Holy Spirit, and you, as an act of will, must take the initiative to make the change. I am sorry for... (insert wrong behavior or attitude). I should not have done.... (insert wrong behavior or attitude). With God's help, I will try not to...(insert wrong behavior or attitude). Do you forgive me for... (insert wrong behavior or attitude)? What can I do to make things better or not hurt you again? If any of these negative feelings or behaviors mentioned above manifest in an unhealthy way that will not allow communication or resolution to continue, then it is best to take a break, regroup, and come back together. However, do not make the mistake of just sweeping things under the rug. If you do need to take a break from the discussion, agree upon a time to come back together to finish the conversation and resolve the conflict. Keep in mind that though there are common principles and ways to resolve your problem, God knows every detail f your conflict and may have a new or creative way of resolving it. Trust Him to lead you to the best method of resolution. put away anger, bitterness, etc. As God leads you and your spouse to resolve conflict, trust Him and He will also restore your positive feelings regarding yourself and your spouse. Remember who He is and who you are in Him. If you allow Him, He can completely restore you and your spouse and bring oneness back into your marriage. 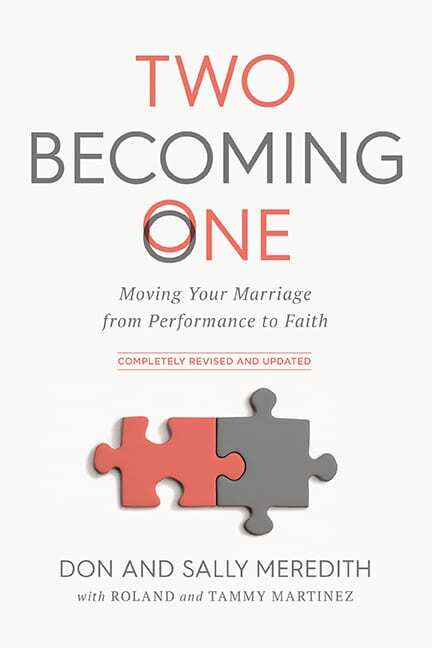 Find out more about communication and God’s design for marriage in Two Becoming One. The Kindle version is also available on Amazon.